It’s a work in progress. 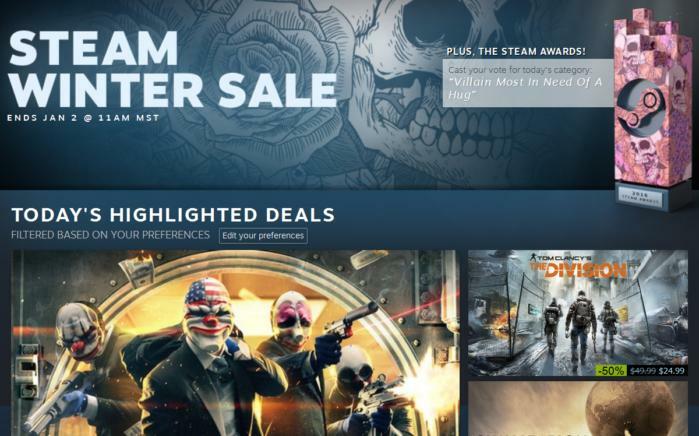 The point is that, as expected, the 2016 Steam Winter Sale launched this morning and with it come a whole bunch of holiday deals. And for once, it wasn’t Paypal who leaked the date! It was some thread on Neogaf—though, true to form, Paypal UK did prematurely confirm the sale date two days ago. Anyway, it’s here and there are some good deals hidden amongst the cruft. Baldur’s Gate II is down to $8, Project Cars is under $10, one of the year’s best action-RPGs Grim Dawn is 45 percent off ($13.74), Cities Skylines is $7.50, Grim Fandango Remastered is $3, and so on. Pretty much everything is on sale to some extent. Dig around a bit. You never know what you might find. Potentially more important than the sales this year is the presence of the first annual Steam Awards, though. Nominees were submitted during November’s Autumn Sale, but voting will take place from now until December 30. You can see the full list of categories and nominees here, but note: You’ll only be voting on one category per day. First up is the “Villain Most In Need Of A Hug” award, with voting running today from 10 a.m. Pacific until tomorrow at the same time, when the clock ticks over to votes for the “I Thought This Game Was Cool Before It Won An Award” award, and so on. Winners will be announced on December 31, and then we’ll all forget about 2016 and start getting hyped for next year’s games I guess. Or some of you will just keep playing Overwatch, I’m sure. The sale itself lasts through January 2 so you’ll still have time to grab the winners on sale at the end. Other than that, keep a tight grip on your wallet and best of luck. And if it’s your first ever Steam Winter Sale? Have fun building up your Steam library. It’s a great experience. And one last note: Steam’s not the only one running a Winter Sale of course. GOG.com’s “Goodbuy 2016” sale starts on Friday with deals on ten “Good Buys” and a bunch of other games. Worth checking out when you get a moment.